Google News is one of the best platforms for the end users to read news from different news agencies at one place. 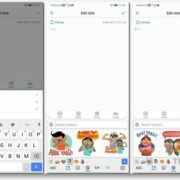 Being a product of Google, you can always expect additional functionalities, which most other platforms do not offer. 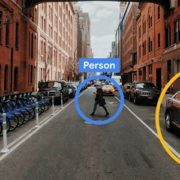 Some of the things that make Google News better than other news reading platforms is the recommendation of news of a particular type based on the current content or article, and suggested articles based on the likes of the user. 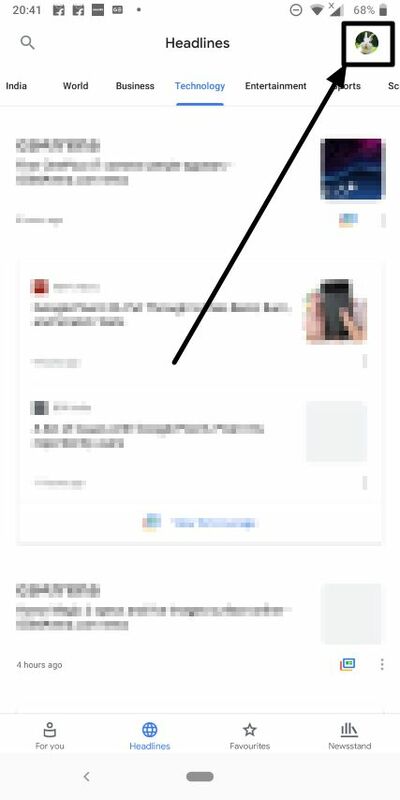 With every update, Google News is pushing its limits to become the one-stop news platform for the news worms out there. 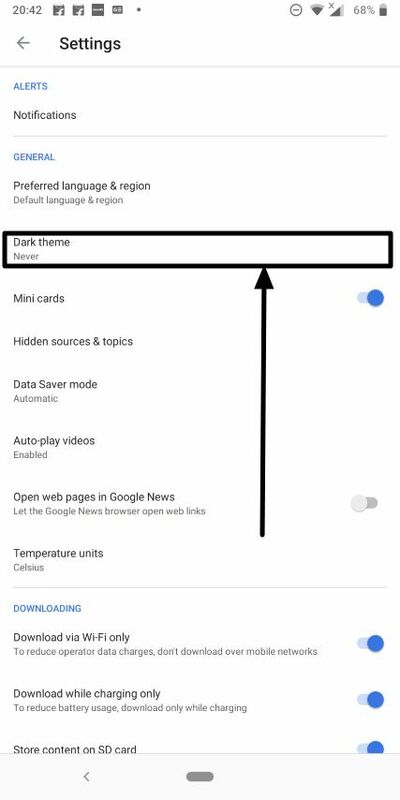 One of the special abilities of Google News is the provision to download news articles for later reading and the option to activate the dark mode to reduce strain on eyes at the time of continuous reading sessions. Apart from the two, Google News also offers a number of other nifty cool features that make it really great. So here I will discuss the ways to activate the night or dark mode for late night news readers, and the option to download the articles offline for later reading purposes. 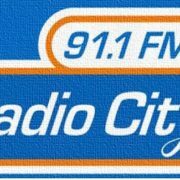 So without further delays, let’s get started. 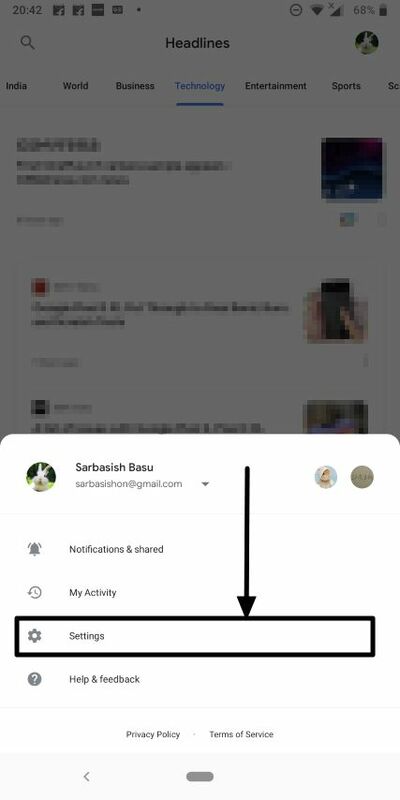 Step 1: Open Google News and tap on the profile icon. Step 2: In the new menu that appears, tap on ‘Settings’. Step 3: Now tap on the ‘Dark Theme’ option. Step 4: In the options available, choose the one that suits your requirements. Choose ‘Always’ to keep the dark mode on all the time. 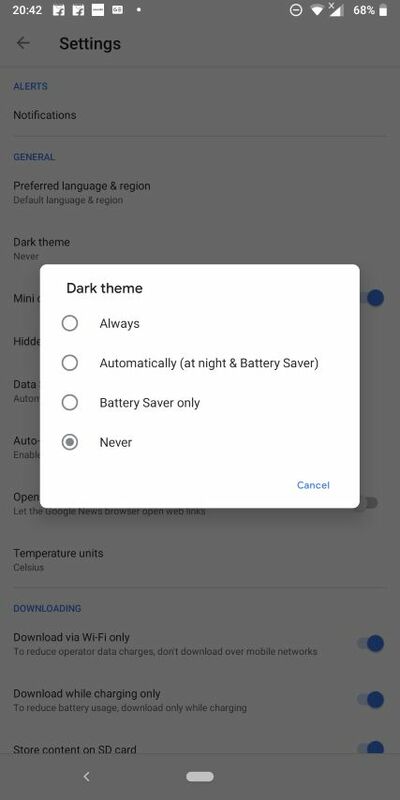 Choose ‘Automatically’ to turn dark theme on or off at night and day respectively, or when battery saver is on. 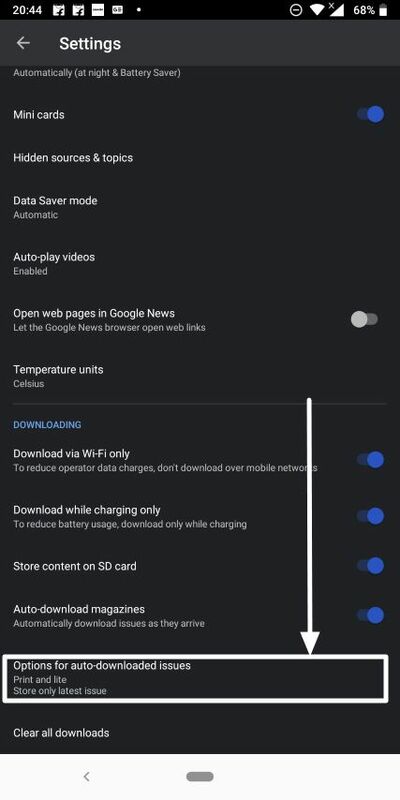 Choose ‘Battery Saver only’ to activate dark mode when battery saver is on. Choose ‘Never’ to keep it off forever. Hope you have already chosen the most appropriate option that will suit your needs, from the list. Step 1: Go the ’Settings’ the same way and scroll down. Step 2: Enable the following options as follows. ‘Download via Wi-Fi only’ – It will download content only over Wi-Fi. 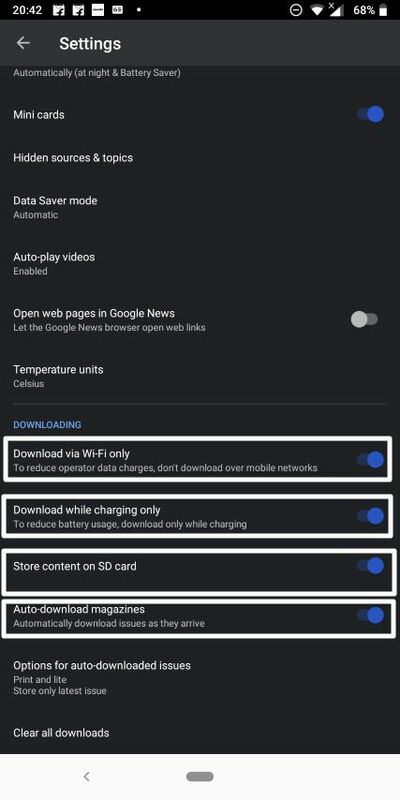 ‘Download while charging only’ – It will download articles only when the device is docked or is charging. ‘Store content on SD card’ – This can be handy if you are suffering from lack of space on your internal memory. All your articles will be disclosed to the SD card. 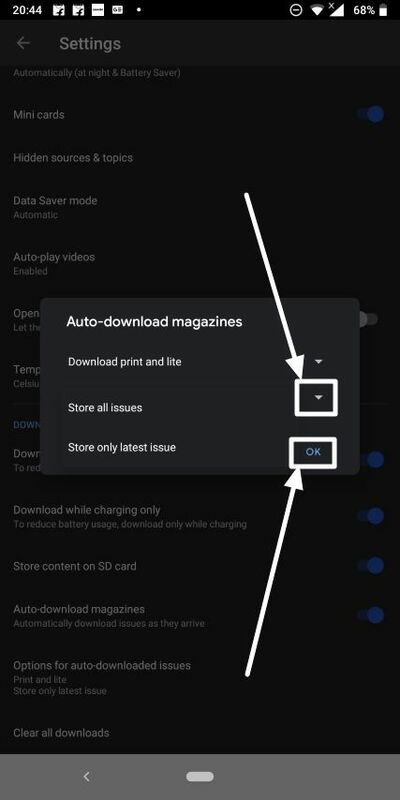 ‘Auto-download magazines’ – If you read a lot of magazines, this feature can come in handy. Just read the magazines whenever you feel like. Either on the go or at some other comfortable time of the day. Lastly, you can configure the option to choose which edition of the magazines you will like to download. Step 3: Tap on the option saying ‘Options for auto-download issues’. 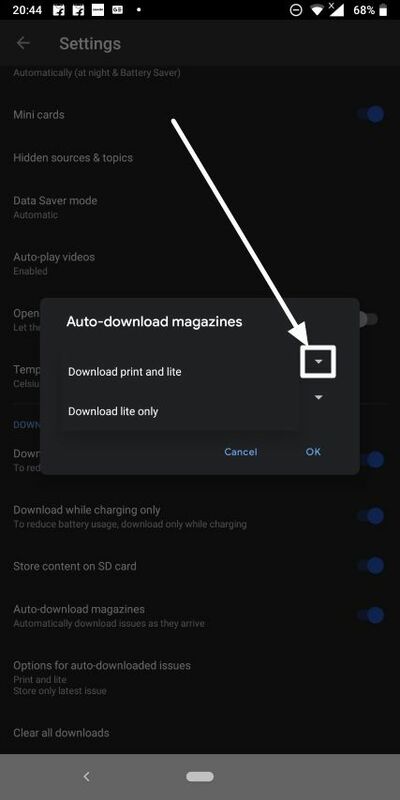 Step 4: You can choose between downloading only the lite version of a magazine, or the lite, as well as the print version of a magazine. Step 5: You can also choose which issues to keep. Just choose the one between storing all the issues, or to store the latest issue. Once you are done, tap on ‘OK’. 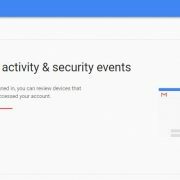 Changing the following settings as per your requirements will surely make your experience with Google News far better than before. You can also change a number of other settings as per your requirements. Changing the following settings is surely going to change your experience of reading news and magazines forever. Hope the shall information was helpful for you. Do you still have any questions? Feel free to comment it down below.